On 11 November, Peuan Mit’s hard working vocational training students who are learning about cooking and hospitality took a break from their regular Monday morning activities to visit the Drop-In Center. Normally at this time they would have been helping to clean the restaurant, but on this particular day they had the opportunity to attend a workshop to engage with clay animation that let their imaginations run wild and their hands create. The activity was organized by Peuan Mit’s Drop-In-Center team for six students and an artist volunteer, who assisted with the activities which ran from 9am-12pm. The workshop participants were young women between the ages of 16 – 19 years old and from similar backgrounds. 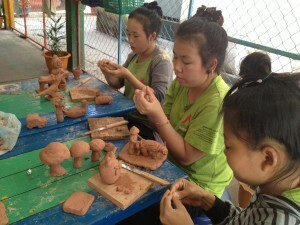 The objective was to support their development and well-being through artistic expression. And of course, to have some fun! Artistic clay animation is one way that young people can express themselves in a safe environment, especially if their lives have been unstable or they have experienced personal trauma. Additionally, arts activities are seldom offered in primary or secondary schools in Laos, so the young people Peuan Mit works with were engaging in a brand new activity they had never experienced, and one which they found fascinating. “It depends on me!” Ms. V. explained excitedly when asked why she liked making her clay creations. Her case worker translated from Lao language to share the various comments from the young women, who described how they liked creating the objects with clay in this workshop because they were free to come up with their own ideas and create something that is entirely unique to them!